Click here to get the Sola Busca Tarot Deck by itself. Measurements: 2.35 x 4.5 inches, or 60 x 115 mm. Back of card: A monochrome variation of the 4 of Wands (shown above). An upright head flows naturally into an inverted head, like the face cards of ordinary playing cards. So these cards may be inverted. The colors are white & dark maroon. Book included: Yes, 206 pages, 4.6 x 7 inches, or 11.9 x 17.8 cm. Unlike the instruction cards included with the deck, the book (illustrated) has specific notes on all the cards, including the unique Major Arcanas. Text by Sofia Di Vincenzo, preface by Giordano Berti. Also included is the usual US Games Ancient 10-Card Tarot Spread sheet. Publisher: Lo Scarabeo. Printed in Italy. Book published by US Games, printed in Canada. "The heavily colored Sola Busca tarocchi pack - the only complete extant pack of seventy-eight tarocchi cards engraved on metal during the late fifteenth century, possibly of Ferrarese or Venetian origin - contains trump cards featuring warriors of antiquity and Latin inscriptions. The twenty-two trumps are single figures based upon ancient history and, except for The Fool, have no counterparts in modern trumps. The name of a classical person, often barely recognizable due to misspellings by the scribe or engraver, appears on each of the trumps except for Mato (The Fool) and on each of the court cards of king, queen and knight except the page." The book sheds a great deal of light on the history of this deck & the individual cards in it. It is highly recommended. In the reproduction, the name of the Major Arcana, spelled as on the original card, has been placed in the black border above the card. 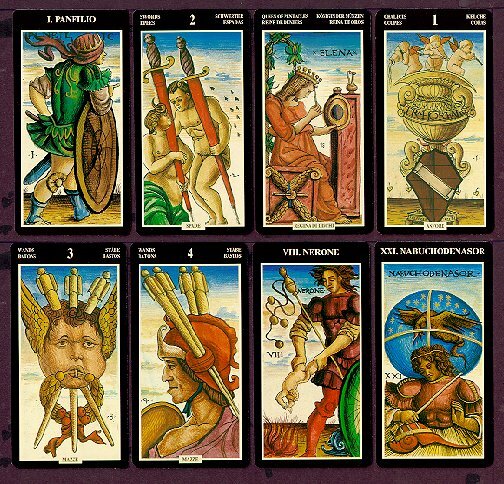 In the minor arcana, the titles at the top are the name of the suit, in English, French, German & Spanish. Centered at the bottom is the name in Italian. I've also heard said the minor arcanas of this deck inspired Pamela Coleman-Smith in her work for the Rider Waite deck. To my eyes, this is not literally true. If she was inspired by this deck, then it was as a point of departure for her own work, which, again in my opinion, is superior. In any case, this is a striking deck.